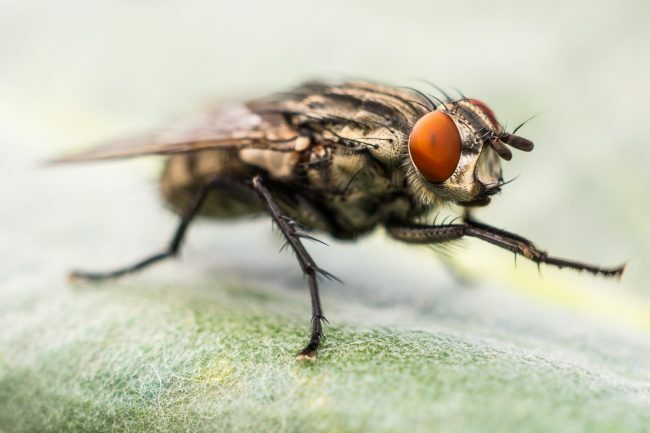 During the late spring, summer and fall months, many homeowners and facility managers notice flies in their property, particularly houseflies. Regardless of how they got in, it’s important to exterminate them promptly in order to prevent an infestation. If you’re in need of fly control services for your Northern New Jersey home or New York City business, contact the fly exterminators at Horizon Pest Control right away. A common fly found in and around homes, the housefly is a prominent pest in the U.S. Besides being a nuisance, they also have the potential to carry diseases. Houseflies are dark gray in color and have an ovular shape, one pair of wings, compound red eyes, six legs and antennae. At most, adults measure a quarter of an inch long. Housefly eggs look like small grains of rice. They’ll hatch into larvae, also known as maggots, prior to entering the pupal stage. Housefly development from egg to adult usually takes six to 12 days. And an adult will only live about 15 to 25 days. Despite this short lifespan, houseflies can reproduce in large numbers. This can lead to a large housefly population in little to no time. For houseflies, the ideal air temperature is a toasty 83 degrees Fahrenheit. On colder days, they’re attracted to the warm air coming from inside homes and buildings. Houseflies will take advantage of structural issues, like ripped screens, to enter a building. Besides warm weather, flies are attracted to trash, ripened produce, animal carcasses, pet feces, soda and moisture, as these are some of their favorite meals. What Dangers Do Houseflies Pose? As carriers of disease, houseflies can contaminate food surfaces with disease organisms. They also regurgitate and excrete whenever they rest. Our residential and commercial client services in Northern and Central New Jersey, Rockland County, NY and New York City can help eliminate your fly problem. Don’t delay. Call Horizon today at 1-888-824-7960.